A Todos os Rapazes que Amei (Topseller I 272 pp I 15,98€) enquadra-se no género romance contemporâneo, muito em voga, onde brilham autores como John Green. 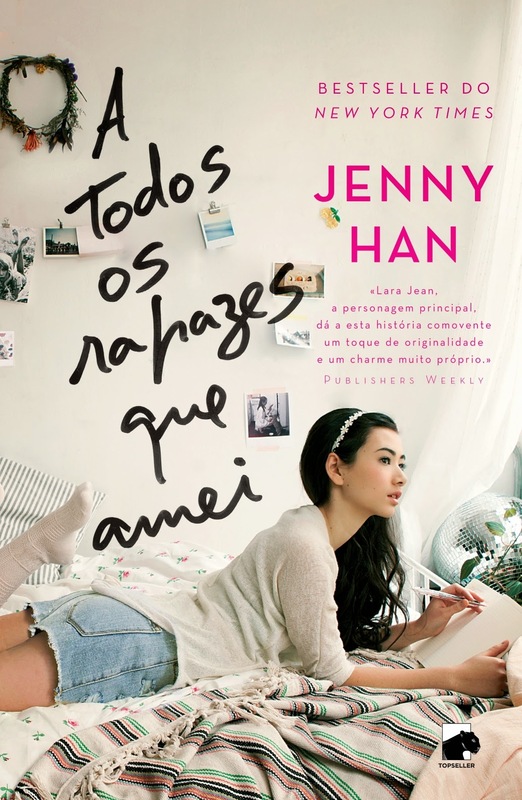 Jenny Han, autora bestseller do New York Times, traz-nos um romance divertido e original sobre o amor jovem. «Guardo as minhas cartas numa caixa de chapéu verde-azulada que a minha mãe me trouxe de uma loja de antiguidades da Baixa. Não são cartas de amor que alguém me enviou. Não tenho dessas. São cartas que eu escrevi. Há uma por cada rapaz que amei — cinco, ao todo. Quando escrevo, não escondo nada. Escrevo como se ele nunca a fosse ler. Porque na verdade não vai. Exponho nessa carta todos os meus pensamentos secretos, todas as observações cautelosas, tudo o que guardei dentro de mim. Quando acabo de a escrever, fecho-a, endereço-a e depois guardo-a na minha caixa de chapéu verde-azulada. A play list de Jenny Han para acompanhar a leitura de A Todos os Rapazes que Amei. 1. "Please Speak Well of Me" by The Weepies: I came back to this song again and again because I could picture Lara Jean listening to it as she wrote her letters. It's so sweet and full of yearning. 2. "Crazy" by Alanis Morissette: This song has such great momentum. You feel like something big is on the verge of happening. It's a great song to listen to if you're writing a book and you need something big to happen. 3. "Only in Dreams" by Weezer: I could completely picture Peter driving around in his mom's minivan listening to this song at top volume. 4. "Alone Again (Naturally)" by Gilbert O’Sullivan: Lara Jean has been in love a lot, but she's always alone in love, and she doesn't actually mind it much. I can see her singing along to this song and smiling. 5. "Teenage Love Song"by Rilo Kiley: Jenny Lewis has the sweetest voice, and this song tells a whole story of love lost. I like that it takes teenage love very seriously because I do too. 6. "The Shoop Shoop Song (It's in His Kiss)" by Betty Everett: This song is on the Mermaids soundtrack, which Lara Jean listens to while organizing her first-week back-to-school outfits. 7. "The Longest Time" by Billy Joel: Lara Jean loves to bake and she would definitely bake to this song. 8. "Our House" by Crosby, Still, Nash & Young: Lara Jean is a girl who loves to be at home, to be cozy and putter around the house. For me, this song is the embodiment of that feeling. 9. "Thirteen" by Big Star: There is no song more nostalgic than this. It feels like a high school experience I never had but wish I did. "Won't you let me walk you home from school? Won't you let me meet you at the pool?" 10. "Love That Girl" by Raphael Saadiq: This is so Lara Jean to me. It's modern but it feels vintage at the same time, with the Motown claps and call and response choruses. 11. "Heartbeats" by The Knife: I listened to this song over and over while writing this book. It's very angsty and emo and kind of tough. 12. "I'm Gonna Get You Yet" by The Dixie Cups: In a lot of ways, Lara Jean is a throwback kind of girl. She loves ‘60s girl groups, vintage clothes, and the romance of a different time. 13. "Big Girls Don't Cry" by Frankie Valli and The Four Seasons: This song of course appears in Dirty Dancing, the quintessential coming of age movie for teenage girls who dream big. 14. "Love on Top" by Beyonce: I love how hopeful this song is. It's so driving around with your sisters with the windows all the way down. 15. "P.S. I Love You" by Nellie McKay: An open window, a breeze, and a glass of lemonade – that is this song. And incidentally, the sequel to To All the Boys I've Loved Before is called P.S. I Still Love You.